east side bride: Pop Quiz: How many wedding trends can you spot? I count seven, but I'm sure I must be missing something. Please note: I wouldn't bother poking fun if the photos weren't gorg. You guys know that, right? Aw man! I just noticed your addendum, otherwise I would be super bummed since I pinned this baby today. In my defense, I like the fabric part the best and I can't stand fake mustaches. and I only counted four, but I'm a novice. I'm only getting six, but you're the expert, so I would believe you. @ anon - Do it if you love it, regardless. Not doing something just because it's a trend is as silly as doing something just because it's a trend. God forbid. Although the mustache things are annoying. I agree too on the gorgeous pics! Such a great backdrop. I also only see four. My favorite part is I just saw this posted on 100LC and then found it here. Thought I was looking at a double post for a second. Aw man, do yellow shoes really count as a trend? I think I see all seven - bunting, fabric backgrounds, DIY photobooth, fake mustache, props on sticks, chalkboard prop and heart sunglasses? God my wedding photos are also going to be a part of this game - succulents, retro cocktails and melted candle centerpieces. Oh well, it was my style before I saw it on the blogs. ok. i'm getting six, but i need to know the ground rules here. are the fake mustache and fake glasses counted separately? i just combined them in the "props" category. THANK YOU. a few months ago I thought, "Man, I can't wait until I don't see anymore bunting." Then there was this picture to taunt me. @Anonymous, yep that is the total 7 i am counting. except interchange fabric backgrounds for cool bowties. SO maybe eight? 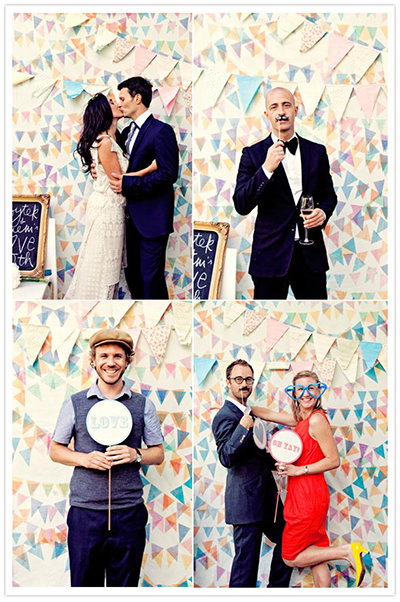 Someone needs to make a Portlandia "put a bird on it"-esque spoof about wedding trends. "put a mustache on it!" yeah, i thought bowtie too! only now do i notice that there's bunting OVER the bunting-print fabric. i can't tell if that's meta or overkill. can we count bright yellow (shoes) as a trend too? That's nine, then. bowties, 10! I love this game. And for the anons- it's largely only a trend in this wedding bloggy world. No one at your wedding is as absorbed in this world as the rest of us. They'll never know about the thousands of other weddings with chalkboards and bunting. It's still so damn cute! Don't be skeered of anything...well maybe ESB. Honestly ... NOT nearly ONE wedding here in Germany looks like this. Lucky me! I can do all the "trendy "pseudo-creative DIY" stuff and having a total unique wedding party. YAY! I think the typeface definitely counts as a trend-- retro-stylized fonts have been all over the place lately. I hope you counted that damn bunting more than once. you did well. i'm with mouse: count the bunting as many times as there are triangles. also, does a "personality" count as a wedding trend? if you call the whole - "absent, but quirky smiling" thing a "personality" "more quotes"
I think "DIY Photobooth that's actually not a booth or diy" counts as a trend. Trends become trends because people like them. I'll be such a trendy bride when my day comes. this is very true. NO ONE has any clue about any of the wedding trends except for other brides. considering 3 of my bridesmaids are getting married within 6 months of me, they know. but no one else does. not even my fiance. also I love bunting but holy hell that is overkill. I'm not sure we can count the bow tie, you guys. I mean, it's a dude in a tuxedo with a black bow tie. Nothing trendy about that. this is classic! the other trends can fade away but we'd like the mustaches and bow ties to last forever! Hee hee! This was a fun game! Although the only trend I'm even starting to get sick of is the mustache on a stick (not too much though! ).